By Ashutosh KS in Photography. Updated on February 14, 2019 . If you can’t stop taking selfies and own an Android device, then selfie apps can help you have fun and take newsworthy selfies just with your phone. Selfie apps offer lots of photo editing and photo enhancement features for selfie addicts, getting you the best fun selfies for sharing with your friends on social platforms. In this post, we’re showcasing the best selfie camera apps for Android platform that assist you in adding lots of fun to your selfies. 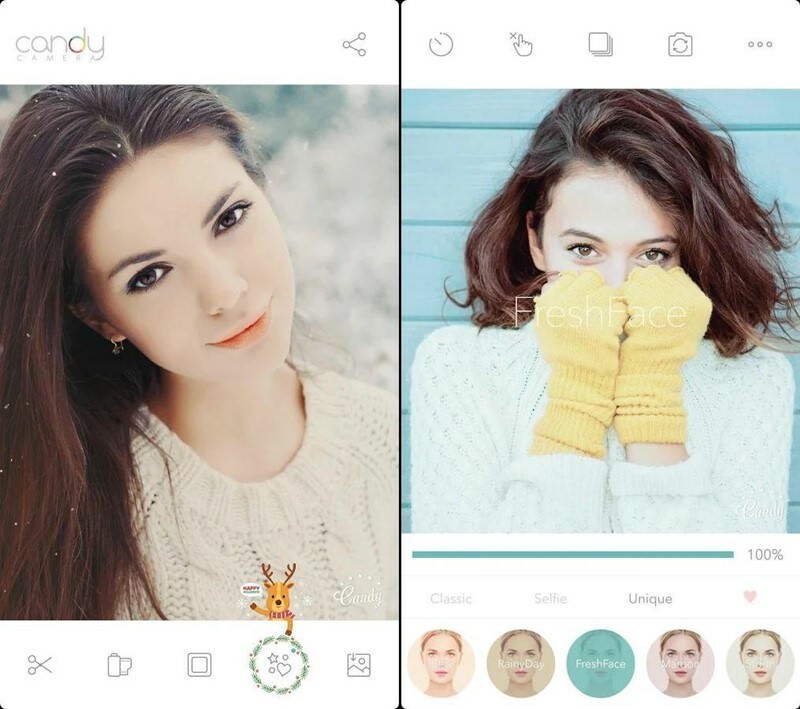 Candy Camera is a renowned selfie app with an intuitive interface for selfie lovers. What is noteworthy about this app is the versatility it offers in taking real-time enhanced snapshots with its swipe-enabled filter options to embellish your selfies. 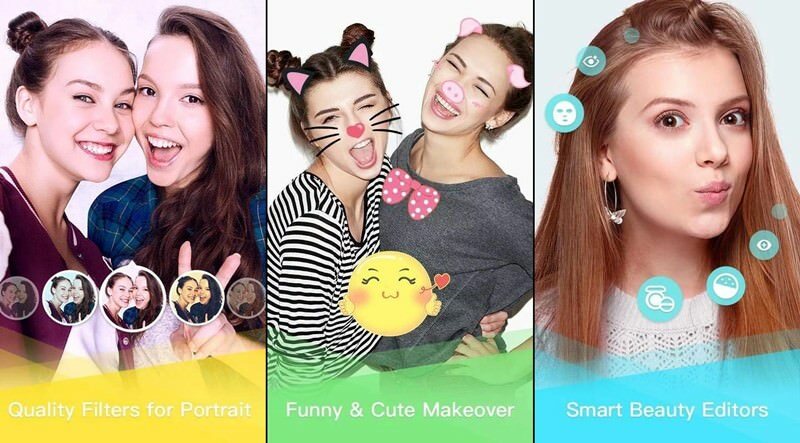 In addition to a swipe left or right function to change the filters, Candy Camera also provides an array of tools with beauty functions like whitening, eyeliner and stickers to Ã¢ÂÂbeautify’ the selfies the way you want. There is also a Ã¢ÂÂsilent mode‘ that can be enabled while using the app to snap photos in places where you would wish to be discreet. Some of its editing tools come as premium features and have to be purchased through the Play Store. Marketed as the ‘ultimate selfie app‘, B612 definitely offers fantastic features that vouch for that title. Other than the usual photo filter goodies (including themes like Secret, Fairy-tale, Thursday and China), B612 goes a step further – you can also take short, selfie videos. 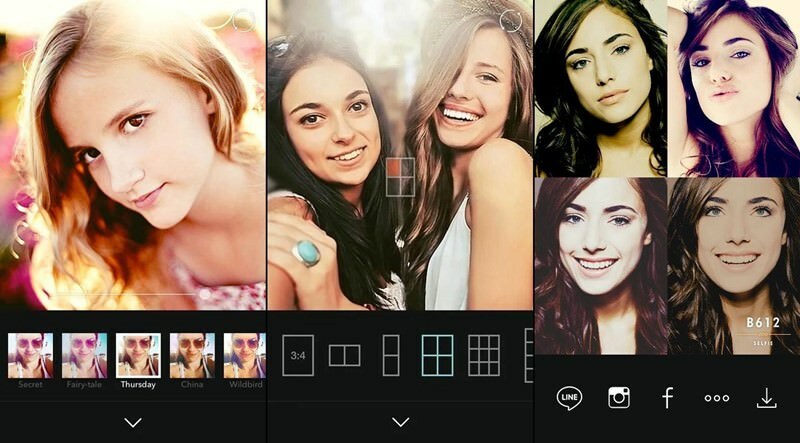 If you find yourself overwhelmed with its filter options, B612 can also choose a filter for you automatically. The app remembers your filter choices and makes smarter suggestions with time. Along with its streamlined interface, it’s also frequently updated with new filters. Cymera is a very popular camera and editing app. It has beautifying functions like facelift, liquify, skin corrections and around 200+ different kinds of makeup items and natural hair styling. That’s not all, even more tools are offered as in-app purchases. In addition to its item-suggestion function and improvements in picture resolution, Cymera is better than many – thanks to its repertoire of tools to perfect selfies or snaps. New users are greeted with helpful tutorials that help them make the best use of its features. Even though it consists of smartly crafted tutorials, the app can be a bit overwhelming for a newbie with its horde of features and photo effects. There is no color saturation and shadow adjustment feature available. As the name says YouCam Perfect is the perfect selfie beauty app. It specializes in enhancing the natural beauty of a person in the photos with its efficient editing tools. 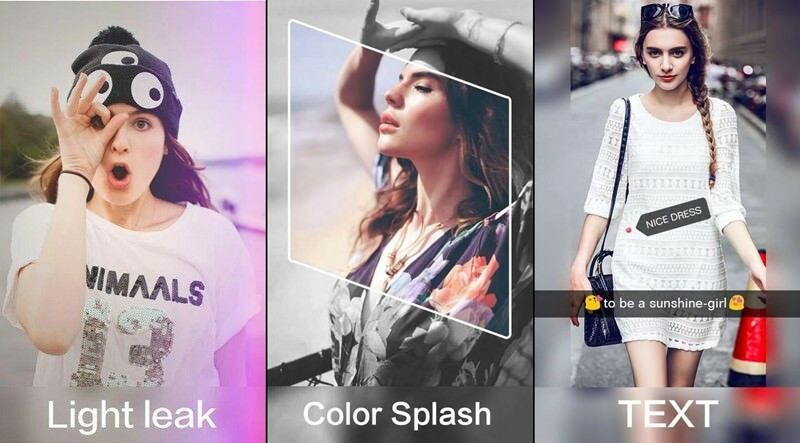 After clicking a snap, it lets you choose any of the 6 beautification levels to get a beautified image instantly. Not only is this app good for close-up selfies, but also for full-body photos. For example, ‘Lengthen Legs‘ feature helps you to quickly add height to your body shots while Ã¢ÂÂBody Slim‘ shrinks your waist to make you look thinner. Some other cool features included are filtered video selfies (4-8 second clips), face reshaper and eye enlarger tools. BestMe consists of unique filter options like World, Maggie and Debby and various other capabilities like face recognition for shooting awesome selfies. Some of the features and filters of the app are vignette options, excellent blur effects and tag and emoji stickers for posting fun-enabled selfies or snaps on Instagram and Facebook. Users allegedly give a 5-star review for ‘unlocking’ and using many fantastic features of this app. Lidow is yet another photo editor with numerous editing features and effects. The app has a stylish UI with a dark background and consists of shortcuts for clicking snaps or importing photos from your gallery for editing them – in easy and quick way. You can use stylish layers to coat your selfies with multiple filters and effects, and can also change the aspect ratios according to your convenience. Some of the included effects are blur, color splash, mirror, etc. and filters are lomo, leak, lens flare, retro, etc. 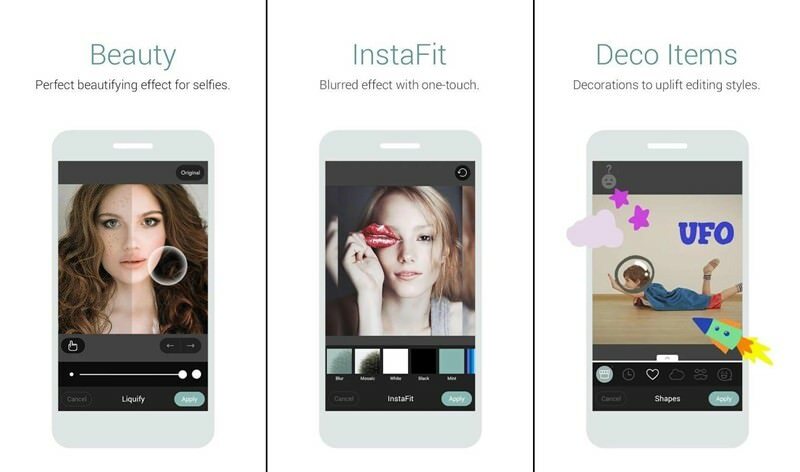 InstaBeauty is a popular selfie editor app with a prime focus on helping users refine and beautify their selfies using smart, easy-to-use features (including photo effects and filters). The app also edits and enhances video shots in real-time during shooting them. The five main features of InstaBeauty are Beauty Makeup, Beauty Camera, Beauty Collage, Beauty Video and QuickSnap. With the power of these features, it is very easy to remove blemishes and fine-tune your selfies, helping you create and share your best selfies. Bestie is considered as one of the best selfie camera apps and was part of the "Top 10 for Google Play Store in 2015" list. Some of the features included in the app are selfie beautifier, night camera, airbrushing, camera effects and cool stickers. The app is equipped with preset effects like Home Away, Pink Panther and Asuka that can be blended and applied to your snapshots. It also offers the flexibility to switch the front and rear cameras by touching anywhere on the screen or by just shaking the device. It has just few manual options and you have little control over tinkering with its features. 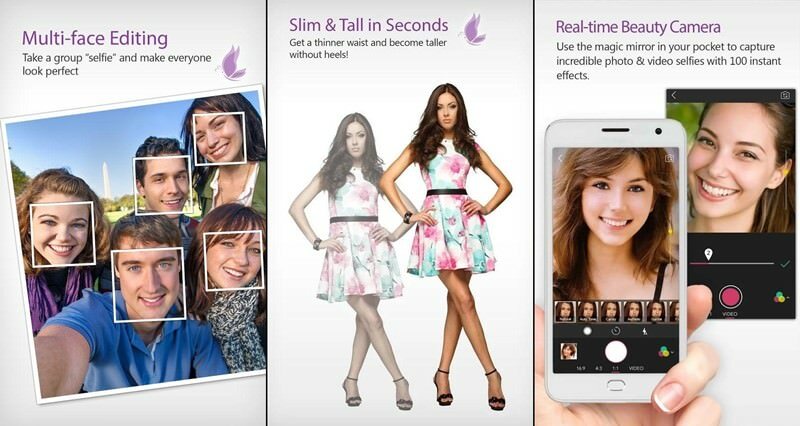 Sweet Selfie is a relatively newer app to hit the market. 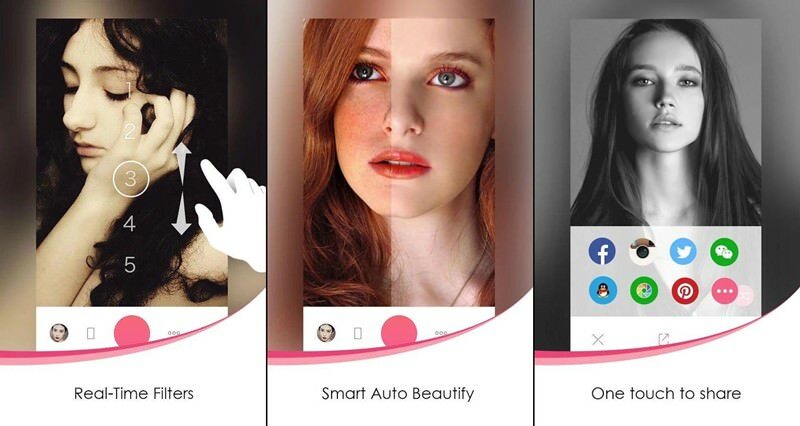 This app comes with ‘smart auto beautify‘ feature and an option to share selfies right from the app. Because it’s specially designed for clicking and editing selfies, features like filter effects, emoji and tag stickers are tailormade for selfie snapshots. Owing to all these, Sweet Selfie allows taking perfect selfies, just as good as its name. Well, these are the best options for creating selfies that get plenty of likes on your social networks. Have you tried any other selfie app too? Don’t forget to tell us using comments.